While scrolling through my IG feed, looking for some sparkle inspiration, I came across a mani done by Alice from One Nail To Rule Them All and totally fell in love. But since this is Sparkle Month, I tweaked her design just a bit, to include some glitter. 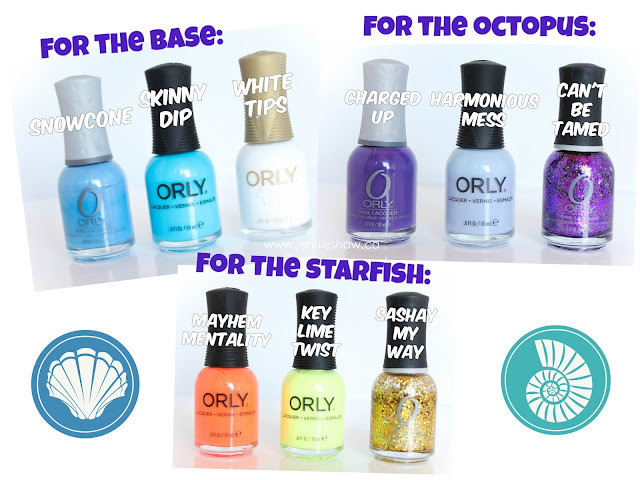 Also, I kind of liked that with my minimalist mermaid mani last week, another "under the sea" kind of mani means I'm almost doing a theme within a theme. Obviously, it was too awesome an idea to resist. Haha! This was my first time using a saran wrap technique and I LOVED IT! After two coats, the blues totally blended together to create a nice "watery" look. I started with one coat of Snowcone, waited about ten minutes, and then added generous dots of Snowcone, Skinny Dip, and White Tips, in a random pattern. With a crinkled ball of saran wrap, I dabbed all the colour together, making sure to use different sides of the saran wrap ball. I waited another five minutes and then added a coat of Glisten and Glow's HK Girl Top Coat. 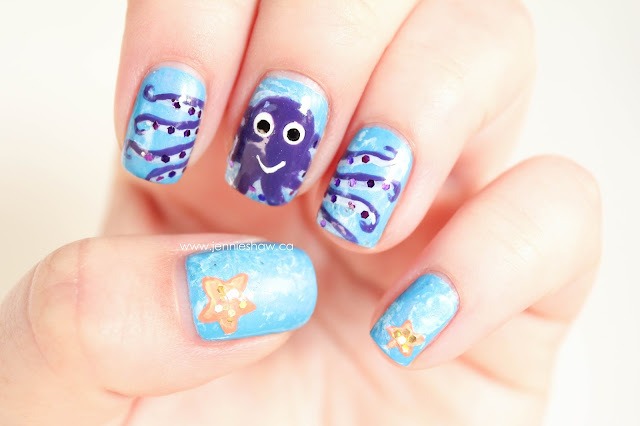 I used a very thin striping brush and outlined the head of the octopus. Then I decided where the tentacles would go and made thin lines to make sure they were even. I wasn't too worried about having the tentacles line up completely, but I tried to space the surrounding tentacles evenly, on my ring and pointer fingers. I thickened each tentacle, added the curls at the end, added a thin line of Harmonious Mess, for contrast, and waited for it to dry. 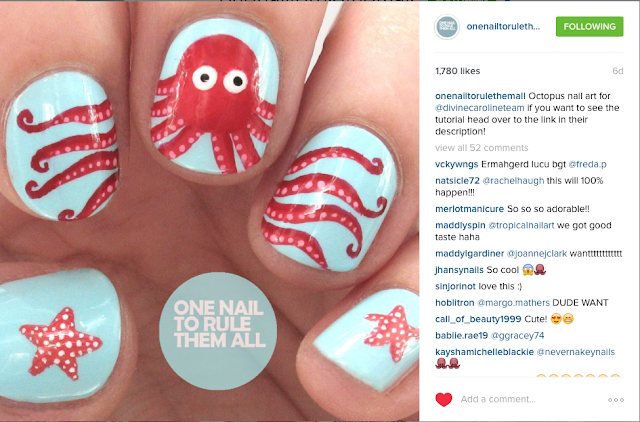 Back on my middle nail, I filled in the octopus head and tentacles, continuing the same thin line of Harmonious Mess. When all the polish was dry, I used the same thin nail art brush to pick out purple hex glitter from Can't Be Tamed and added them along the bottom of each tentacle. The final touch were the octopus eyes, but I put them up too high and had to add the smiley face because otherwise, it looked kind of weird. Haha! 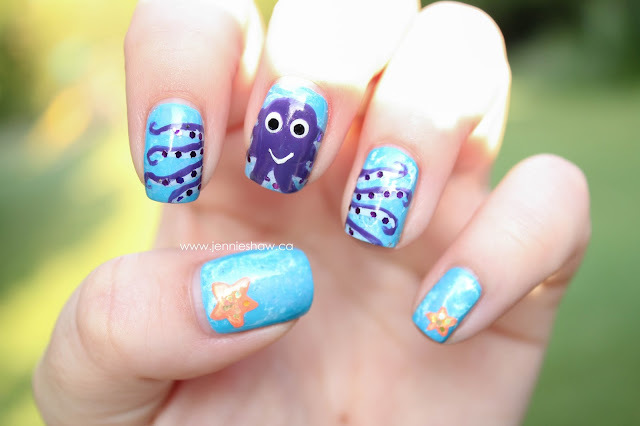 I used the same thin brush as I used for the octopus (cleaned, of course, haha) and outlined the starfishes. Then I filled them in and while Mayhem Mentality was still wet, blended Key Lime Twist into the middle. When that had dried, I picked out gold hex glitter from Sashay My Way. A final coat of Glisten and Glow's HK Girl Top Coat sealed everything together. Whew! Definitely a high-effort mani, but one that I'm so happy I did because it's so much fun! 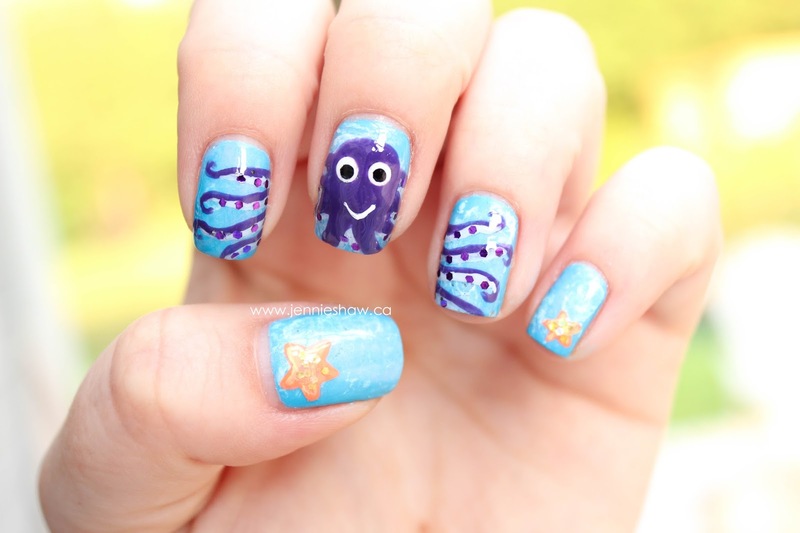 such a fun manicure for summertime. This week I'm rocking pink and gold. The nails I linked up are light purple and silver. So cute. 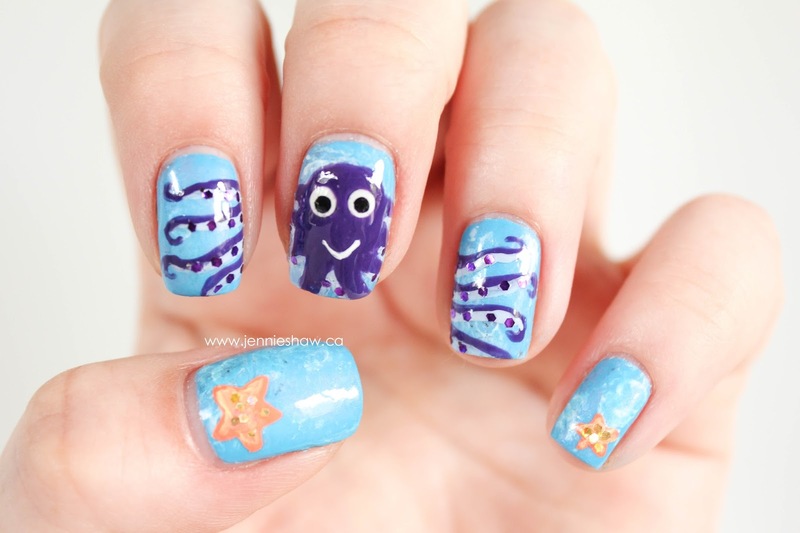 I love beachy/sea creature things. I'm a crab (cancer), so I like all of that. Super cool, I love the purple version even more!